Ever wanted to fly a seaplane? For many people, a transition from land-planes to seaplanes is a challenging but enjoyable long weekend course where a new skill is learned and capability gained. As with any aspect of aviation, the more you know before you show up to fly, the better prepared you will be and the less expensive time you will waste in the air learning what could have been learned on the ground. 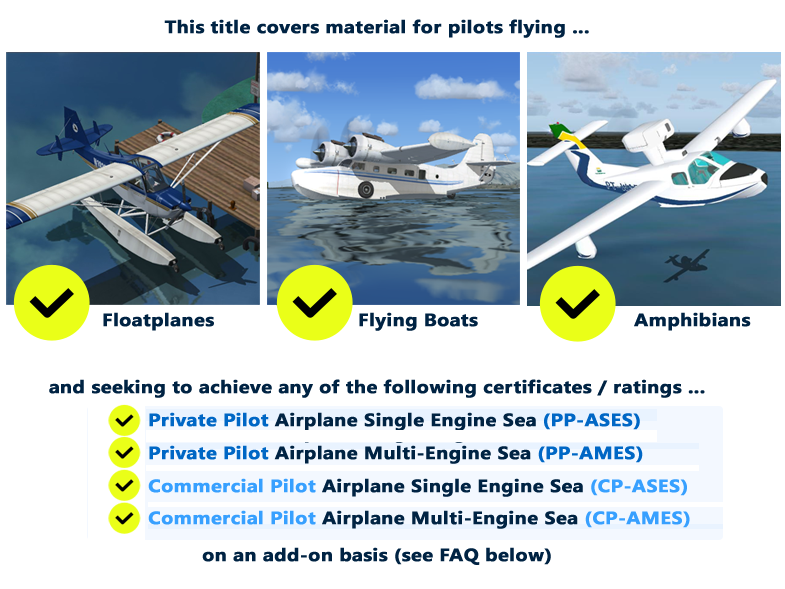 Our RideReady: Seaplane Pilot software will, in an interactive question-answer presentation style, take you through the key knowledge points as determined by the FAA that are crucial for safe and effective seaplane operation. RideReady: Seaplane Pilot is mainly intended for pilots who already have an airplane-land certificate/rating and want to add the seaplane rating. If you are such a person, then you have taken a checkride and know what an examiner wants from you during an oral - not complete mastery of every last technical detail, but rather a solid functional knowledge of terms, procedures, and contingencies coupled with sound judgment and effective problem solving skills. For years after you get your seaplane rating, as a refresher tool. RideReady: Seaplane includes free lifetime upgrades. You can be studying using RideReady: Seaplane in minutes - just download and install the software from below. It's available on a "try before you buy" basis to ensure your satisfaction. We thank you for giving it a try. For whom is this software intended? This software is mainly intended for licensed (land) airplane pilots who are intending to add a seaplane rating. It can also be used by pilots for whom their first license will be in their seaplane, though this title really only covers seaplane-specific stuff and such "ab initio" pilots might also therefore want to consider our Private Pilot Oral Exam Prep software which covers more general airplane information that the typical "conversion" user is likely to already know. Long after your checkride as you can use this software as a refresher. Upgrades are free for life! Float-planes vs Hull-planes? What about float equipped helicopters? Yes, this software will give you the knowledge areas for both major types of seaplanes. There is no helicopter-specific information in this software, though much is common with the airplane information. This is a constantly evolving answer, since we constantly update RideReady as necessary. For the most complete answer, download RideReady and give it a try, remembering that the demo version gives you access to only about 5% of the questions. How can I be sure that the information contained in RideReady: Seaplane will be compatible with my course? 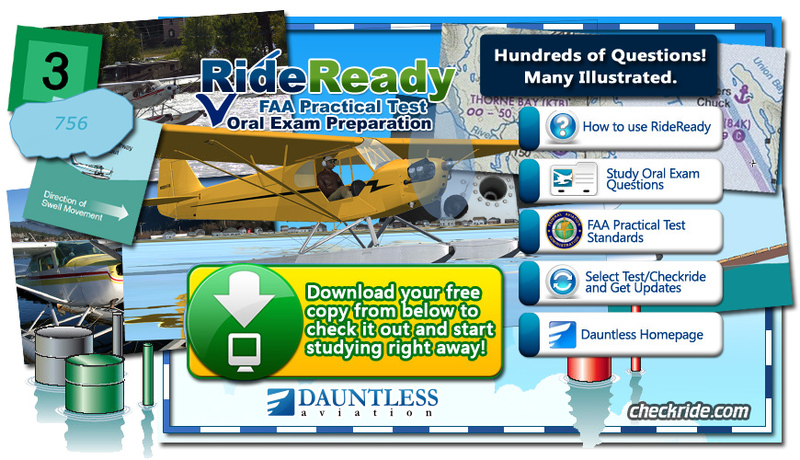 RideReady: Seaplane pilot very closely follows the FAA recommendations and practices for seaplane flight, so the chance for discrepancy is quite low. In fact, much of RideReady comes from exact FAA recommendations on the subject that have been categorized, organized, and edited to make your learning very efficient. Thanks for checking out RideReady! Good luck in all of your flying goals! !